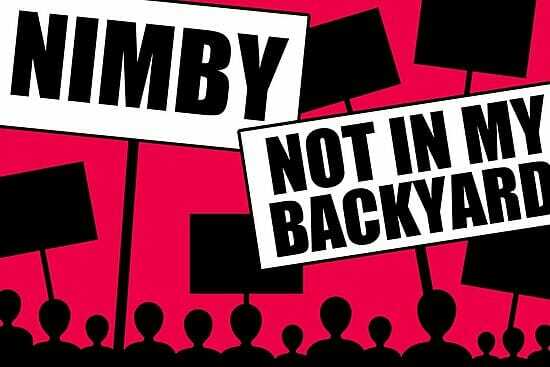 NIMBY, an acronym that stands for Not In My Back Yard, is used to characterize the opposition of residents to a proposed development planReal Estate Development ModelA real estate development model usually consists of two sections: Deal Summary and Cash Flow Model. Within the Deal Summary, all important assumptions – including the schedule (which lays out the timeline), property stats, development costs, financing assumptions, and sales assumptions – are listed and used to in their area. NIMBY describes the phenomenon in which communities will adamantly resist a development plan near their area regardless of whether positive or negative externalities are generated. NIMBY is used to describe communities that act in their own interests and oppose nearby developmentsReal Estate Investment Trust (REIT)A real estate investment trust (REIT) is an investment fund or security that engages in income-generating real estate properties. The fund is operated and owned by a company of shareholders who contribute money to invest in commercial properties, such as office and apartment buildings that they would otherwise support and benefit from if developments did not take place near their area. The concept of NIMBY explains (1) the phenomenon of low public acceptance to new developments, and (2) the reason behind strong opposition to new developments from those who live in close proximity to the proposed location. According to studies, there is often unjust opposition to development projects; whether a project is beneficial or not to the community, communities fear the unknown. Projects that are beneficial to the community face heavy opposition as NIMBYs feel that the new development projects will generate a negative externality (while it may not be the case!). Residents do not believe that developers will act in the best interest of residents. NIMBY acts as a protection mechanism – no matter how beneficial the development may be, communities fear that there may be other motives in play. Individuals in a community identify with their own group. When a new development plan takes place near their community, residents often feel that their culture is threatened by outsiders. Communities fear change. Objections are deeply rooted in the fear that the new development will change the identity or character of the place that residents have a strong connection with. The following are some examples of NIMBY reactions to two development projects. The construction of airports is a necessity; the preference for air travel continues to grow. Although the construction of airports pose a significant benefit to the overall community through employment opportunities, international connectivity, improve tourism, etc., NIMBYs will highlight the air pollution, increased traffic, noise generation, and height restrictions. The construction of housing structures benefits the overall economy by making housing more affordable, improving the location’s economic conditionsAggregate Supply and DemandAggregate supply and demand refers to the concept of supply and demand, but applied at a macroeconomic scale. Both aggregate supply and aggregate demand are, and providing employment opportunities. NIMBYs will highlight the potential increased crime rate, decreased utility for existing residents, and disruption from increased traffic. RainCity Housing is a group that provides houses for people living with mental illness, addictions, and other challenges. As the organization prepared to open its housing facility in 2012, the organization faced immense backlash and opposition. Communities, business owners, and residents attended town-hall meetings to express their discontent and anger with the construction of the housing facility. The concern was that these tenants would pose safety concerns and attract drug dealers to the neighborhood. The project by RainCity Housing became so controversial that an executive director received a death threat. Six years later, the initial NIMBY reaction dwindled down as the tenants integrated successfully and found employment. People who strongly opposed the project realized that no negative externalities were generated. In fact, the community even experienced improvement. Commercial Real Estate BrokerCommercial Real Estate BrokerA commercial real estate broker is a middleman between sellers and buyers of commercial real estate, who helps clients sell, lease, or purchase commercial real estate. A commercial real estate broker has the freedom to work either as an independent agent, or as a member of a commercial real estate brokerage firm. Asset ClassAsset ClassAn asset class is a group of similar investments. Different classes of investment assets – such as fixed income investments - are grouped together based on having a similar financial structure, and because they are typically traded in the same financial markets and subject to the same rules and regulations.